Rent a compact and comfortable 18-passenger minibus for a quick day trip, a scheduled shuttle service, or for any other short-distance travel needs. With comfortable amenities, spacious interiors, and a personal driver to operate the bus for you, this bus is perfect for small traveling groups. A private bus allows your group to travel in an organized manner without having to worry about navigating or parking. Trust Total Charters for all of your bus rental needs-- we’re available 24/7 to work with your group to find the perfect bus for your trip. With service areas in Chicago, Lexington, Louisville, Detroit, St. Louis, and beyond, we’re always able to take you exactly where you need to go. 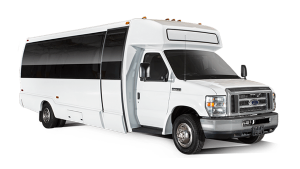 We’ll find the perfect 18-passenger minibus for any upcoming group trip, including your wedding, corporate convention, or field trip. Call our reservation specialists today at 1-866-303-2594 to reserve your bus!